Out of all the dishes that I cook, this is Sunnie’s favorite. She describes it as “so frickin’ awesome”, so you can’t ask for a better endorsement than that. Seriously, I spent years tinkering with this recipe. As a bonus, this dish can actually be considered both Korean and Chinese – Korean Tofu Kangjung (Kanjung means crunchy dish) and Chinese General Tso’s Tofu! Sunnie loves this dish as it reminds her of all the yummy spicy Korean fried rice cakes or Korean fried chicken snacks she used to have when she was growing up in South Korea. 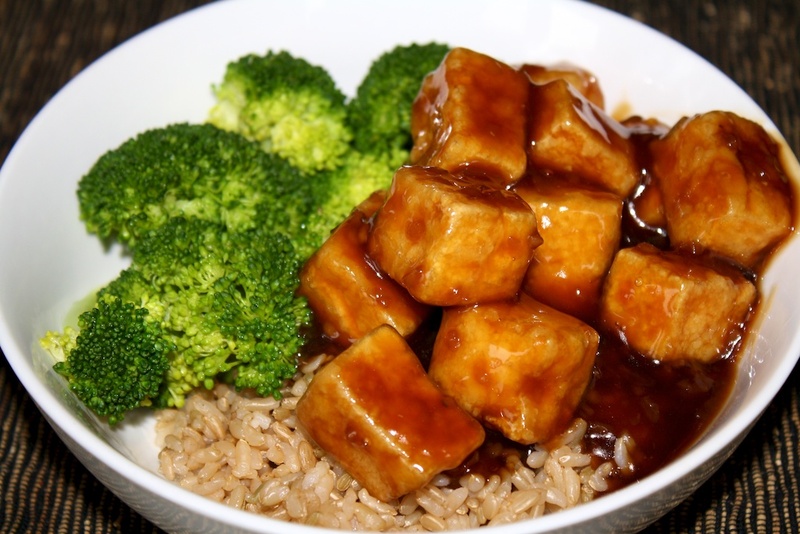 Vegan Tofu Kangjung (General Tso’s Tofu) Recipe! Press the tofu to drain the water from it (freezing the tofu beforehand gives it a chewier texture and really makes a difference). To press the tofu, place it between two absorbent towels on a cutting board. Put several heavy books on top and let sit for 15 minutes to half an hour, minimum, up to two hours. The longer, the better! The key is to push out the water without breaking the tofu. If you’re in a hurry, you can get away with squeezing the water out with your hands (only if you’ve frozen it beforehand), just be careful not to break it. 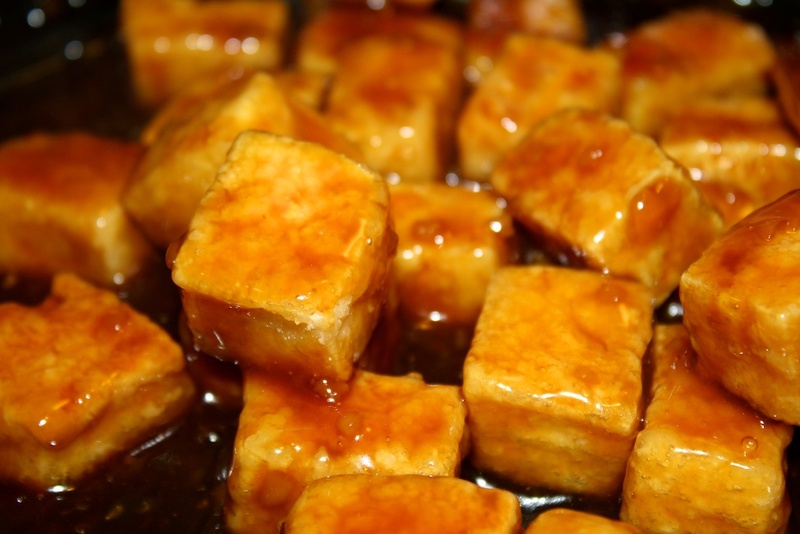 Slice the tofu into 1″ by 1″ cubes. Put the tofu in batches in a bag or container with a lid, add the corn starch and shake to coat. Add more corn starch if needed. 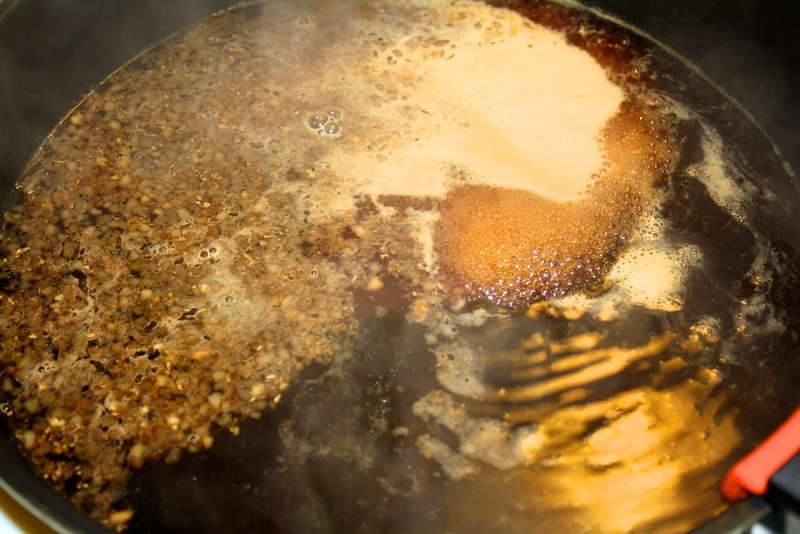 Heat oil in a small pan over medium heat and fry tofu in batches until crisp and slightly brown, turning to cook both sides. I usually can get away with a couple of Tbs of oil to do the frying if the pan is small enough, so you don’t have to deep fry; although, you certainly can. Just be sure to use enough oil so that it doesn’t stick to the pan and the level is high enough to cover half of each tofu cube. Cut broccoli into bite sizes and steam (if desired). Add 1 cup of water and all of the the sauce ingredients except the cornstarch and water mixture to a large pan, stir to dissolve the sugar, bring to a boil over high heat and cook for several minutes. If desired, you can first saute the garlic, ginger, and red pepper in a tablespoon of oil for a couple of minutes before adding the other ingredients. Add the cornstarch and water mixture to the sauce and continue to cook, stirring. When the sauce thickens enough to be syrupy remove from heat. If the sauce is too runny, combine a little more cornstarch and water and add to the sauce. 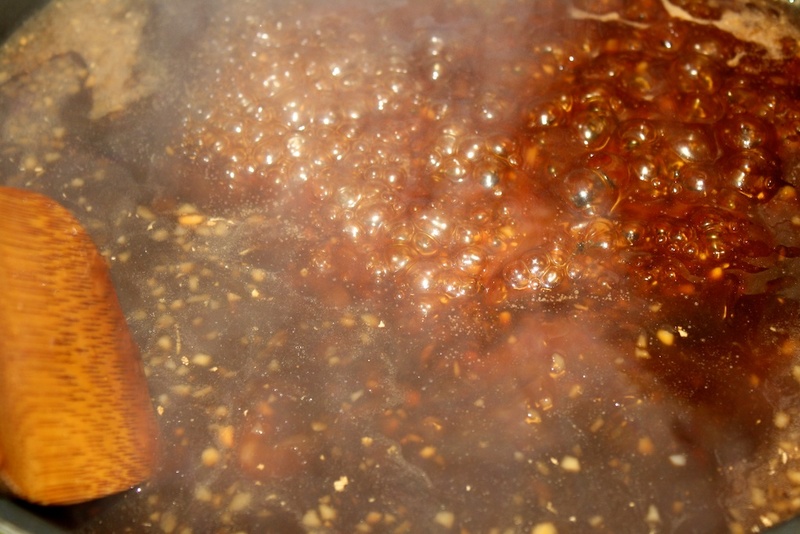 When sauce has thickened enough, remove from heat and allow to cool slightly. Add the fried tofu to the sauce and stir and flip to coat (if desired, you can add the broccoli too). Serve with brown rice and the steamed broccoli on the side (if desired)! * NOTE: if you’re looking for a lower fat version of these, skip the corn starch, lightly spray the tofu with canola oil and bake the tofu in an oven preheated to 450 F for around 20 minutes, checking to make sure it doesn’t burn. It won’t be quite as crispy, but you cut out the fat from the oil. Fry the tofu in batches and remove to a paper towel to remove excess oil. Cook the garlic and ginger in the sauce before adding cornstarch mixture. One tip to make sure that you always have ginger handy is to place it in your freezer, and then just use a zester or micro-plane to shred the frozen ginger when you’re ready to use it! You want the ginger pieces very small so that it flavors the sauce but you don’t bite into pieces of it. The sauce will thicken after you add the cornstarch mixture. 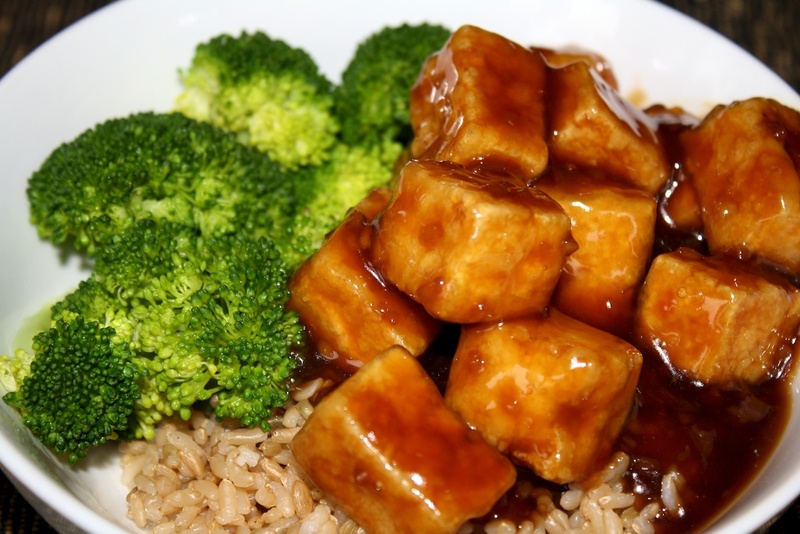 Remember to remove the sauce from the heat and allow to cool slightly so that it does not make the tofu soggy when you coat it. With brown rice and steamed broccoli, this is a delicious treat of a meal. This is a go-to dish for me when I have guests over and often surprises people who aren’t really tofu fans by showing them what a great texture it can have when prepared this way. Hi, Julie! I hope you like it. Honestly, the sauce is what’s so awesome, so you could have it on about anything, and it would taste good. I haven’t tried this without freezing the tofu before, but if you end up not liking the frozen version, just give it a try with normal, pressed tofu. There’s no way it won’t still taste good! Hope you enjoy! Hi Bill! I finally got around to remembering to freeze some tofu so I could try this recipe. It came it great! The frozen tofu texture didn’t bother me like it usually does. I will definately be making this often. Thanks! You’ve just proven that you CAN teach an OLD dog ndw tricks. I bought tofu again last week for the first time in several years. Found about the freeze/texture thing so mine was in the freezer when I found your recipe. General Tso’s chicken is one of my favorite things, so had to make this. Had everything needed except agave syrup and fresh ginger so substituted brown sugar(pretty good) and ground ginger(not as good as fresh,but this is high quality ground so was acceptable. Added a few drops of water and let it rebydrate for few minutes and it runs second to fresh). It is fabulous, but will definitely not be out of fresh ginger when I make it again very soon. I am a 78 yo woman and I’xe learned a lot from your site this morning. Thank you. Fantastic, I’m glad you enjoyed it! Hey, recipes are general guidance – we throw things together differently all the time depending on what we have. That’s part of the fun! Thanks for visiting! I’ve never been able to get my tofu stir-fried to have the texture I want, I’m going to have to try this. When you freeze it, do you remove it from the package, drain the water, and put it in another container or bag to freeze it? Hi, Greg. No you just freeze the entire package. Then you thaw it, open it, and drain the water. Hope it turns out well for you! I have been lucky enough to have Bill’s GT tofu two times. It is awesome! I am not sure we will every completely convert….but the fact that he was actually LOOKing at tofu in the store makes me think…”never say never”. Oh and by the way…we are going to try this tonight. I don’t have agave syrup so we are going to try it with New Hampshire Maple syrup. I am sure it will give it a unique flavor. Plus we don’t have frozen tofu, but we are giving it a shot with “unfrozen” tofu. Wish us luck. Good luck! And remember that you can use sugar too. I’m not sure what result the flavor of maple syrup will have, so you’ll have to let me know! I actually bought the agave syrup. It came out really good. Not as good as yours, but we are going to try again. I added the juice of 2 clementines to the syrup and some roasted red and yellow peppers that I had in the fridge. We both liked it and decided to buy some tofu to keep in the freezer for next time. I also think I might add some pineapple. I think the more I change it, the more it gets closer and closer to sweet and sour tofu. But the point is we loved it. AND we made rice in our awesome rice cooker. We love that too. We just make a batch of rice and keep it in the fridge and tend to have a little every meal now. Thank you a bunch! Vanessa!!! So glad it turned out well, be sure to share it when you perfect your sweet and sour recipe too!!! 😉 Miss you and happy holidays!!!! Great site. I’ve been wanting to start making some vegan Korean dishes for a while! Going to have to make this dish in the next week or so. Looks great. Hi, Christopher! Thanks for visiting our site and for your kind words. I hope you enjoy this dish; it’s one of our absolute favorites. Let us know how it turns out. I made this last night (Baked the tofu) – it was a major hit in my house even with my non-vegan 19 year-old son!! Fantastic recipe!! Awesome! I’m glad it went over well. Thanks for letting us know, Deb! 2nd time making this & We Love It!!! We’re a K-Crazy family from California. K-pop, K-Dramas & now K-food! Thanks for the awesome Vegan dishes. We love them, keep them coming please. Wonderful, so glad you liked it! Thanks for letting us know how it turned out! I made this the other day and it was awesome. I had made rolled eggs for my non-vegan children and they ended up fighting over the tofu. Good thing I had doubled the recipe! We will definitely be making this again, thanks for the recipe! Awesome! Thanks for letting us know. We love to hear how the recipes work out! I’m pretty pleased to find this website. I want to to thank you for ones time just for this wonderful read!! I definitely enjoyed every part of it and I have you book-marked to check out new stuff in your site. thanks for the recipe! i didn’t freeze the tofu before frying it, but it still turned out crispy & delicious. Glad you liked it, Katie! Thanks for letting us know how it turned out! Is there a non-alcoholic substitute for the white wine? Also, do you think rice vinegar would work in place of white vinegar? Hi, Cory. I think you’re probably ok just eliminating the white wine. As for the vinegar, I would think that’s probably going to be ok, but I haven’t tried it myself, so I can’t guarantee it! Good luck and let us know how it turns out! Hi, cubuwu! You just need some spicy kick, so if you can get dried red pepper, you could grind it yourself, or use another substitute to add a little spiciness to it. Good luck and hope you like it! I grow Thai dragon peppers. Delicious in this recipe but HOT!!! As I likeit. Don’tknow if this is too commercial, but this person can buy online from a company called My Spice Sage may diferent kinds of dried peppers. Good quality and never a shipping charge. Exellent quality. I use this site frequenty. what is the purpose of the white wine? Hi, Stephanie. I found it improves the flavor – more vinegar goes a bit too far in the sour direction, more sugar too sweet. The wine kind of gives a bit of both but in a different way. I think you should be able to skip it no problem if you don’t have any on hand. Cooked this tonight, and we loved it! I didn’t have any white wine, so I just used rice wine. Also used sambal oelek instead of the red pepper flakes. Thanks for the recipe! Awesome, so glad you liked it, Todd! I’m so excited to find this site……again……however, living in Vermont, I sort of cringed (tee hee) when I read New Hampshire maple syrup….is it even real? lol But I digress….I’m going to try this recipe tonight. My tofu is being pressed even as I type this….thanks!!! Ah, regional rivalries…. Not even the syrup can remain neutral! 🙂 So glad you’re giving the recipe a try. Let us know how it turned out! OH!!!! YUM and then some. I used the agave…I chickened out with the maple syrup idea…and this is wonderful!!! Thanks for the recipe!!!! Are you in NH? Sorry I’m late to the party, but I just had to comment. I’m devouring this meal as I type! I did the hand-squish method with my thawed tofu, used rice vinegar instead and only 3 T of amber agave syrup (since the rice vinegar is sweeter), and it came out perfect. A simple yet flavorful meal that this busy, gluten-free vegan will make again! Made this tonight..omg SO good! I used one tablespoon of crushed red pepper to make it super spicy! Served it with a garlic lemon broccoli. THANK YOU! Awesome, glad you enjoyed it! Thumbs up on the extra pepper flakes. I like it spicy too. Thanks for letting us know how it turned out! Thanks for the tip!! i will try it.next time. This is amazing! Just made it and ate it! I did one substitution that I highly recommend. I used nutritional yeast instead of cornstarch to coat the tofu. I tried it both ways and liked the yeast best. it gives it a nice flavor and has B12 which vega n’s need. Fabulous recipe! Glad you liked it, Jill, and thanks for the tip. We’ll have to try it sometime! Thank you so much for this amazing recipe! I searched for General Tso recipes after a friend suffered a horrible bout of food poisoning eating the dish from a top-rated NYC Chinese takeout restaurant in the East Village. This was my first time frying tofu (been a vegan for 7+ years) and I might have cooked it too long, as it was REALLY tough–how long do you fry each side?). The sauce is a perfect consistency with a robust flavor. Thanks, also, for your many, helpful tips! Huge fan of this recipe and blog! Hi, Amy! Thanks for the kind words! You just want to fry it long enough for it to be crispy – a light golden brown. Freezing the tofu also makes it more dense, so some prefer skipping that step. Hope you enjoy and let me know if you have any other questions! O M G G G!!!!!!!! I just made this simple & DELICIOUS meal & I think I have reached enlightenment! Seriously though, I can really die happy now. THANK YOU! So glad you liked it, Anna! Thanks for the update on subbing the wine too. We just had some of this the other day – one of our faves! Oh yes… I too was out of white wine so I subbed Mirin & an extra shot of vinegar. I just made it!!! it is absolutely amazing!!! But Your sauce look caramel, my came out not that translucent. Is it because I substitute starch for flour? Hi, Marina. Glad you liked it! If you substituted flour for starch in the sauce, that could cause some color change I suppose. You used soy sauce, right? That also provides color to the sauce, so a lighter soy sauce could also impact the depth of color. I tried it and loved it ! Delicious, thank you for this amazing recipe. I think it’s probably fine. Hope you enjoy! It turned out awesome!! The sauce was delicious! Yummy recipe, thanks! 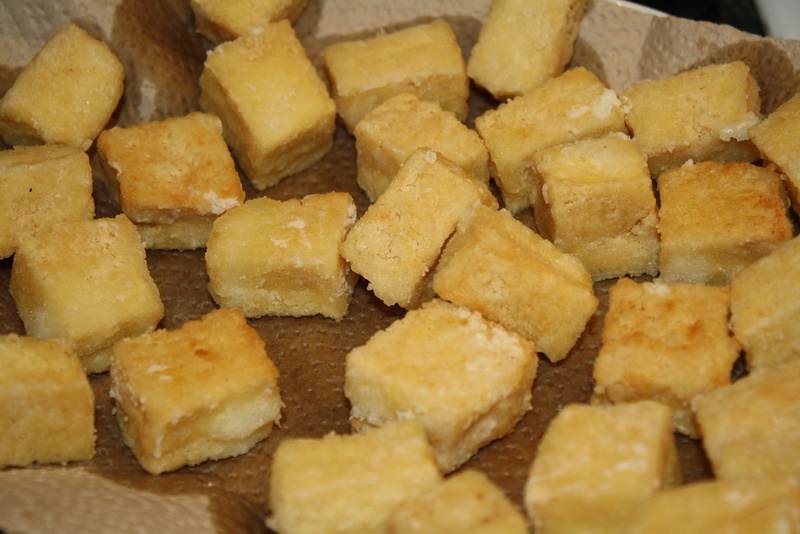 Frying tofu is a treat for me, but I’m very pleased at how the light cornstarch dredge helped it crisp. I tried making this yesterday and loved it! The sauce was amazing…thanks for the recipe! Hi. Can you use regular firm tofu and not just extra-firm tofu? Thanks for the recipe!!! I was trying this and adding the corn starch was a bit difficult. I think it might be easier to roll the cubes in the corn starch. Just tried this, and it was great! I’m not a big fan of spicy foods so I would add less red pepper next time, but overall it was fantastic! Awesome, glad you enjoyed it! Fantastic, glad you liked it! This is unbelievable….absolutely delicious. I mixed the broccoli with the tofu…which is even better! The only thing I’d change next time, is if I’m gonna mix the broccoli with the tofu I’d double the recipe. FYI I made this AFTER I ate dinner and dessert (so I could have when I get home from work tomorrow) and couldn’t stop eating the tofu…its that good. Really Good I just made this…im going to make it again …and again..:)) thank you so much! Wonderful, glad you liked it! 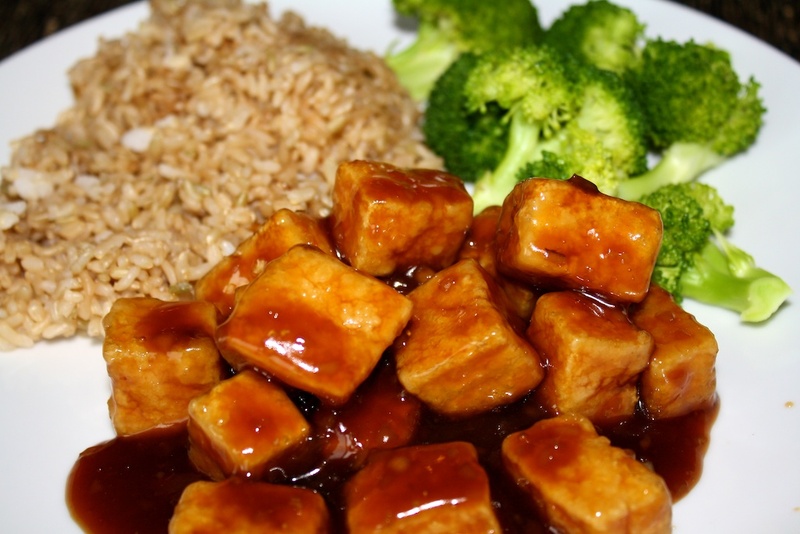 Bill, I have never had Tofu, gave this a try and it was wonderful, will be buying more Tofu as it is so good for you. Thanks for this yummy recipe. Awesome, glad you liked it. I love tofu, so very glad you gave it a try! The best way to make tofu is TofuExpress. Hi, Bill! I just made this! Mm-mm-mm! Thank you SO much for this recipe! I am loving it! I appreciate all of your efforts!